A gemstone, (a precious or semi-precious stone), is a piece of mineral, which is cut and polished and then is used to make jewelry or other adornments. Also certain rocks or organic materials that are not minerals (such as lapis lazuli, amber or jet), are also used for jewelry, and are often referred to as gemstones as well. Most gemstones are hard, but some soft minerals are used in jewelry because of their luster or other physical properties that have aesthetic value. Rarity is another characteristic that lends value to a gemstone. Their colors, properties, myths, and legends are diverse and fascinating. Folklore about stones has been revered and honored for centuries in all cultures..from earliest antiquity engraved gems and hard-stone carvings, such as cups, were major luxury art forms. A gem maker is called a lapidary. William Jewelers has a very wide selection of gemstones and mountings and all can be mixed and matched to make any number of beautiful and stunning creations. 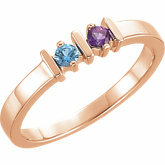 We also can set your own gemstones into new mountings to make a fresh piece of jewelry to treasure! Please stop in and see! The information presented on these pages was compiled from a wide variety of rock, gem and lapidary books and from information gathered on the internet. We look forward to seeing you!!! JANUARY~ GARNET The name “Garnet” is believed to have derived from “pomegranate” with its red, Garnet colored seeds. FEBRUARY~ AMETHYST Amethyst's intense color and relative availability have ensured its popularity throughout the millennia. MARCH ~ AQUAMARINE Aquamarine appears at its best when the gem stones are able to show their brilliant clarity with a plentiful light source. ​APRIL ~ DIAMOND Diamonds are so hard they can only be polished by other diamonds. More than 250 tons of ore needs to be blasted, crushed and processed to yield one carat of rough diamond and of that rough, only 20% is suitable for gem cutting. MAY ~ EMERALD Clarity and transparency are the most important characteristics when evaluating the value of Emeralds. When evaluating from a face up position, very fine quality Emeralds should enable the viewer to see the back facet. JUNE ~ PEARLor ALEXANDRITE A natural Pearl forms when an irritant works its way into a particular species of mollusk that is actually closer to a scallop than an oyster. As a defense mechanism, the mollusk coats the irritant. Layer upon layer of this coating (known as nacre) is deposited on the irritant until a lustrous pearl is formed. A cultured pearl undergoes the same process. The only difference being that the irritant is a surgically implanted mother-of-pearl bead or nuclei. JULY~RUBY Rubies are one of the toughest gemstones, and breakage rarely occurs. This makes Ruby perfect for all kinds of jewelry. PERIDOT ~ AUGUST Peridot ranges in color from light yellow-green to the intense bright green of new grass to olive green. Peridot mining was traditionally done at night when the stone’s natural glow is easier to see. 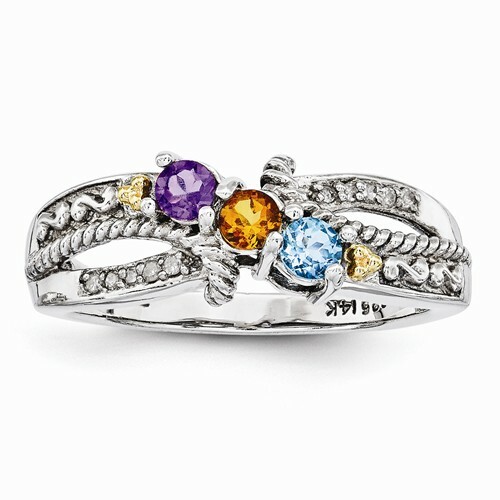 SEPTEMBER ~ SEPTEMBER With hardness just below that of diamonds, sapphires are one of the toughest gemstones. 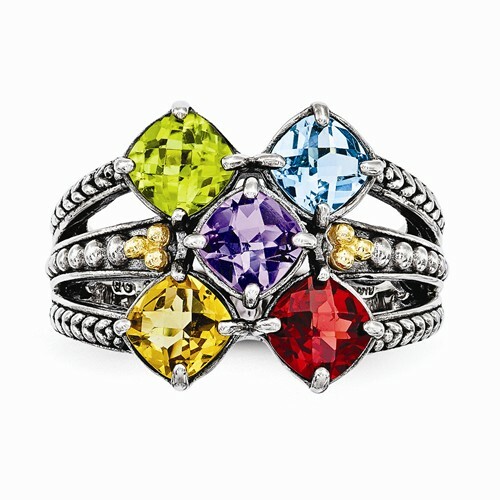 Sapphires come in all spectrums of color, except for red. OCTOBER ~ OPAL or PINK TOURMALINE The physical structure of opal is unique. Tiny spheres of silicon dioxide form a pyramid shaped grid interspersed with water. Tiny natural faults in this grid cause the characteristic "play of color". The effect is similar to the rainbow colors displayed on a soap bubble, only much more dramatic. NOVEMBER ~ CITRINE citrine is a golden yellow form of quartz which takes its name from "citron", the French word for lemon. DECEMBER ~ BLUE TOPAZ Topaz can display a wide variety of colors and even unusual effects - such as is seen in smoky topaz. The modern word topaz is derived from the Sanskrit word "tapas". It is a fluorine aluminium silicate and comes in a wide array colors; yellow, yellow-brown, honey-yellow, flax, brown, green, blue, light blue, red and pink ... and sometimes it has no color at all.